Cheerful and retro, Edward Miller's "Play All Day" sports series is a colorful way to encourage your little fan! 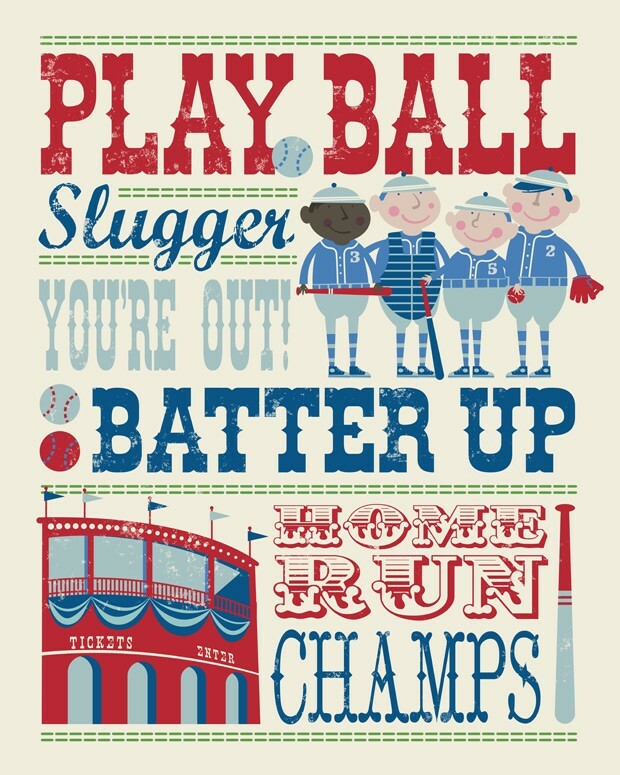 Favorite terms of the game are represented on this classic giclee canvas art in a fashionably antique style font. All Oopsy Daisy artwork is custom printed in the USA. Canvas wall art is reproduced in our San Diego studios using the best digital reproduction method currently available, resulting in great clarity and color saturation. After printing, the canvas is stretched by hand over a custom built 1.5” wood frame. The canvas wraps around the sides providing a finished decorative edge. A saw tooth hanger is attached for easy hanging and artist biography information is included on the back so that children can learn more about today’s working artists. Canvases are exceptionally durable and can be cleaned with a soft, dry or slightly damp cloth.